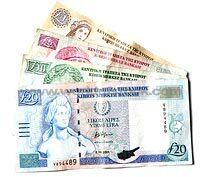 Just a reminder that if you still have some old Cypriot pounds lurking at the back of a drawer from pre-Euro trips south of the border, now is the time to cash them in. As of the end of this month, free exchange of old Cypriot pounds for new shiny Euros will be withdrawn. You will still be able to exchange old notes for a further ten years and coins for two years, but only at the Central Bank which will charge you for the privilege. The concept of outdated currency has always a source of fascination to me since my days as my family's Monopoly wizard, but I had never heard of current currency being worthless - until now. The Famagusta Gazette reports that a private plane is stuck on the tarmac at Paphos airport after being grounded by Customs officials. The private jet had only stopped to refuel when the Customs officers made a routine inspection. Inside the plane they found dozens of suitcases, bursting with almost 5 billion US dollars worth of bonds. Yes, you read that right, 5 billion. The US organization who owned the plane claimed that they did not need to inform the banking authorities in Cyprus because the bonds were not worth anything. But, if they were not worth anything, why were they being flown by private jet? Next time I fly to the UK, I will claim that despite being a major celebrity in the blogsphere (! ), I am actually totally and utterly worthless. With a bit of luck, I too should get flown home in a private jet, or at least get an upgrade. What do you think? Cyprus44 forum - the new TRNC newspaper? Ditch the Euro, embrace the Lira! This web page is served on 19 April 2019 at 23:16:57.